Habitat: Riparian. 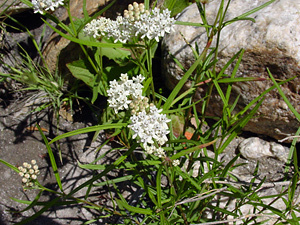 It grows in riparian woodlands and in low to mid-elevation mountain canyons. Description: The flowers are in umbels at the stem tips. Each flower is up to 1/2 inch (1.3 cm) across and has 5 reflexed petals and a hooded central column. The leaves are green, opposite, and linear to narrowly lance-shaped. The stems are erect. 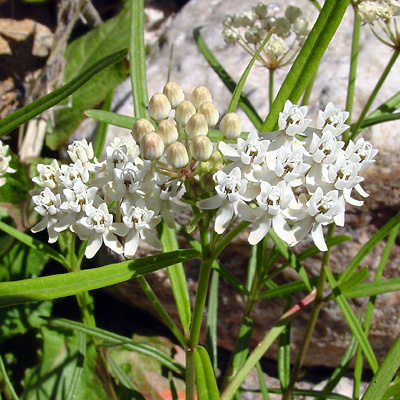 The similar Horsetail Milkweed (Asclepias subverticillata) and Whorled Milkweed (A. verticillata) have narrower, whorled (not opposite) leaves.